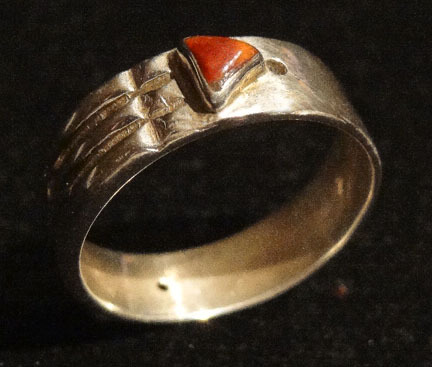 The Atlantis Ring is one of the most fantastic miracles of the micro-vibratory physics, where the wave forms are the invisible agents that compose today the science of the future: Radionics. Approximately 3,500 years before the second Dynasty of Pharaoh Sent, Egypt was visited by people from Atlantis, who brought all the wisdom of their country to the priestly caste. They gave the Atlantis Ring, with its seals intact, to the High Priest Jua, whose tomb was discovered in the Valley of the Kings in 1926. The mummy, perfectly conserved, had beside him the mould of the ring sculpted in stone. The ring, with its three straight lines, six pyramids and two isosceles triangles, follows the esoteric formula from Atlantis. The six pyramids through the three channels generate constant energy. It has special powers and potential, which were recognized through the experiences of the scientist Andrés de Bellzal, who rediscovered the form energies, and of the radiesthesist investigator Roger de Lafforest. During the last twenty years, we have proved scientifically with unquestionable evidence, how to protect, heal and activate the extra sensorial gifts. Only during the day, if it stops you from sleeping, as it intensifies parapsychological faculties. With your hands, form the pyramidal shape in front of your eyes and look through it. Raise your hands forward, fix your eyes in the sky through the pyramidal shape and focus your mind on your best wish or on what you expect to obtain. Return slowly to the initial point. Afterwards, put your hands together in front of your chest, as if praying, and firmly think again about what you wish to happen. Success will depend upon the frequency and firmness with which you repeat this Atlantis Ritual.